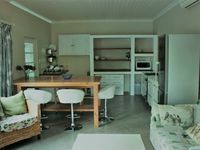 Property 5: Splendid well-equipped Rondebosch Self-Catering Cottage. Property 13: SUNNY COTTAGE IN TRANQUIL GARDEN SETTING. Property 19: Your home away from home! Property 21: Ideal location; just 50 meters from the beach with sea view. Corner Cottage is a charming comfortable cottage just 1 km from the beach. Property 32: Corner Cottage is a charming comfortable cottage just 1 km from the beach. Property 35: Las Vegas at De Kraal Estate ... ideal starting point for Golfers! Property 42: Cycad House @ De Kraal Estate ... ideal starting point for Golfers! Property 43: Jacaranda Cottage @ De Kraal Estate ... ideal starting point for golfers! Property 45: Sunny and spacious garden cottage, close to beaches and wine farms. 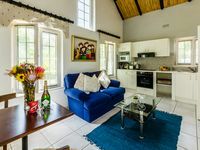 Property 49: Lemon Tree Cottage @ De Kraal Estate ... ideal starting point for golfers! Very nice place. Perfect location. The pool was very pleasant surrounded by plants and trees. The cottage was well equiped and comfortable. The only thing less practical was the pr&eacute;sence of 2 kitchen : one upstairs with the oven and one downstairs with the fridge and the dishwasher. The contact with the owners was easy and nice.